Which books do you pack for a road trip? Socks, check. Snacks, check. Books? Do you pack books when you take a family road trip? Tell us which books are your favorites. 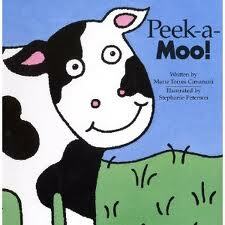 Peek a Moo was one of our daughter’s all time favorite books. It’s a lift-the-flap book and I think every flap had been taped back on before we broke down and bought a new copy for her. The book must be popular with other children too because I have since found Peek a Zoo, Peek a Pet and Peek a Boo (great for Halloween). This book is perfect for children ages 1-3. 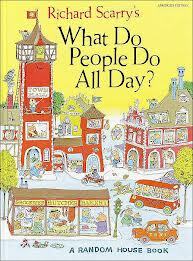 What Do People Do All Day is another favorite. Did you read it as a child? The thing about Richard Scarry books is there is just so much to look at so kids are entertained for much longer than flipping through a book with a simple picture on each page. What Do People Do All Day is the favorite in our house, but don’t forget about Cars and Trucks and Things that Go or The Best First Word Book Ever. These are good books for kids starting at age 2 and our daughter still likes them today and she’s 6. Where’s Waldo can be so much fun and sometimes so exasperating! 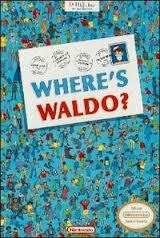 It is a book for older kids, as young ones (and sometimes adults too) will get frustrated searching for the skinny guy in the red and white striped turtleneck. But if you have a kid who likes a puzzle this book is for you. In the newer versions of the book they have added more characters beyond Waldo. Now you can look for a Wizard and a little dog in a red and white sweater too. Hours of fun! This book is probably best for kids kindergarten and above. p.s. I just discovered there’s a Where’s Waldo app too. The I Spy collection of books are another great series that is perfect for all ages. You can use the clues given by the book to find different items on the page or come up with your own search. 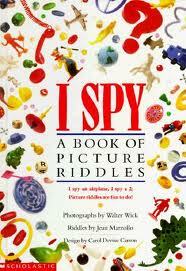 The I Spy books have been a big hit in our family for years and we are still finding new things on the pages. These books are best for kids 2 and older. In addition to traditional paper books there are of course audio books and apps for kid’s books you can download on your iPad or iPhone. These are great for trips too. Check out these two great websites for some of our favorites. Tales2Go has a large selection of audio books for kids of all ages. Perfect if your child can’t read in the car or just can’t read yet. PicPocket Books has a great selection of digital children’s books for your iPhone or iPad. And don’t forget the National Book Festival this weekend on the National Mall in DC. Click here for my blog from last week which has complete information. The weather is going to be perfect so I hope you’ll make plans to go and maybe your child will discover a new book to read on the way home! If you are enjoying these blogs be sure to like us on facebook, follow us on twitter or sign up to have the blog emailed to you each week. And follow us on Pinterest for even more of our favorite kid’s books. How do I find a kid friendly restaurant in DC? Ah, the challenge of eating out with kids. 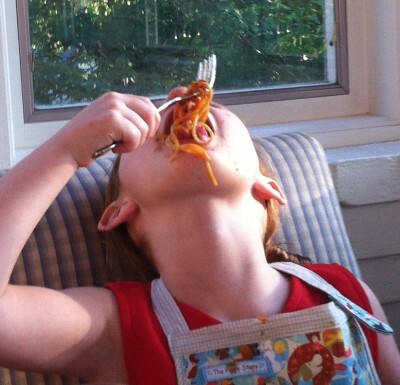 How do you find a restaurant that you can enjoy and is appropriate to take your kids to? I was having dinner with a friend the other night who pointed out a very important point, not all cities have the benefit of Open Table and so for some of you visiting DC this is a new and fabulous tool that takes a lot of the guess work out of finding a restaurant and making restaurant reservations. Open Table allows you to make restaurant reservations online and read restaurant reviews from patrons. It is available on your computer and as an app on your phone. You simply enter in the time you would like to make a reservation for and for how many people and open table pulls up the restaurants with availability both at that time and around that time. You are able to do further searching by area which is great if you want to stay close to your hotel or grab a bite after touring a museum. You can also search by type of restaurant or for a specific restaurant, both within DC and the surrounding areas. Open Table gives you a price scale and the reviews are a great way of getting a sense of whether the restaurant is appropriate for your kids. A newer online reservation site to DC is CityEats. This website was created in partnership with the Food Network (which I love). It is available on your computer and as an app and works on the same principle as Open Table. Select your time and number of people and CityEats will pull a list of available restaurants together for you. You are also able to narrow down your search by area or type of restaurant. The site has great pictures of the restaurants and reviews written by the website staff, but also includes helpful reviews from patrons. Two of the kid friendly restaurants that came up in my search were Cafe Bonaparte, great for fancy pancakes (more commonly known as crepes, but remember it’s all how you sell it to the kids) and Hill Country BBQ, banana pudding – need I say more? TIP: Don’t forget to cancel your reservation if you decide to go somewhere else, or the kids have a break down and you just can’t swing it. As the daughter of former restaurant owners I know how important this is. Another great site to check out is Out To Eat With Kids. Type in your city and state (not just Washington, DC – try your hometown too) and find restaurant deals in the area that are tailored to kids and families. Two of our favorite DC area restaurants that participate are Red Hot & Blue and Chicken Out. Watch for the KidsLiveWell logo next to restaurants that offer healthy kid’s meals and be sure to check out the Out To Eat With Kids blog for even more tips on healthy eating for your kids at restaurants and at home. Sign up to receive information about their giveaways too. What are your favorite restaurants in DC to visit with kids? Would you like the the Kids Will Travel weekly blog delivered to your inbox? Click here and sign up. My daughter was three when I got my first iPhone. She is now six and fully integrated into the iPhone/iPad world. As parents we constantly struggle with how much time to let our children play on the computer or watch tv, but apps have relieved some of this guilt because there are so many great apps out there that actually teach your child something. Duck Duck Moose ($1.99) These were some of the first apps we downloaded for our daughter. The interactive games teach the kids nursery rhymes, letters and numbers. Some of our favorites were Itsy Bitsy Spider, Baa Baa Black Sheep and Fish School. Matching Zoo (Free) by Tomato Interactive, this version of the game Memory is another one of our favorites. My daughter has always been better than me at this game, at any age. Note: You don’t need the volume to play the game. Hint, hint. Toddler Teasers ($2.99) has both flashcards and “quizzes” to help your child with their letters, numbers and shapes. As the child answer questions correctly they earn stickers. Every kid loves a sticker, even if it’s electronic. Maverick Software ($0.99) has a series of similar apps that allow your child to make everything from sundaes to salad. You are provided the ingredients and are then able to choose different toppings, etc. Our favorite was the cupcake maker, maybe not the most educational choice, but I was amazed how long kids will play. Road Trip Bingo ($0.99) by Bright Bunny is the bingo game app we used and found it to be very kid friendly. This is my favorite car game. PicPocket Books ($0.99 – $3.99) Love this app, it’s like having a children’s library on your phone. You’ll find a large selection of books and you can decide if you would like the book read to your child or you can turn off the audio and let the child read it themselves. This is a great choice for a child at any age, but especially an early reader. Tales2Go (Free for 30 days) Another great choice to instill the love of reading in your child. These are purely audio books. Your child can sit back and let their imagination run wild – perfect if your child is prone to car sickness! Take advantage of the free 30 day trial, you’ll be amazed at the choices available. The Secrets of Grisley Manor (Free) This app is not scary at all, especially if you turn off the music. My six year old needed help (from her mom and her grandfather), but it is great fun to wander through the rooms of the house searching for clues. A second version called, “The Lost City” was just released…we’re working on that one now! The best tip I have: Don’t forget the headphones!